Holidays. It might be a little early to think about them, as it's not even Halloween yet. But you know what? I so don't care. 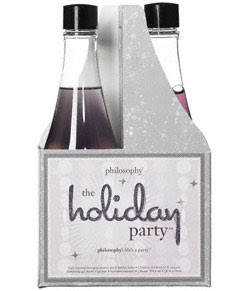 At the Philosophy Holiday Preview last week, I came across this duo -- The Holiday Party -- and simply had to check it out immediately. As soon as my eyes fell upon this duo, packed with the brand's high-foaming 3-in-1s, I just knew I had to check it out. And the fact that the scents are pomegranate and lavender? Totally loving it. Each smells utterly unbelievable, and the scents linger just enough on the skin to make perfume unnecessary yet not completely off limits. And what do I mean by the term 3-in-1? If you're as yet unfamiliar with Philosophy's signature product -- and shame on you, if you are! -- then here's a quick explanation. Each bottle can be used as bubble bath, shower gel and shampoo. And trust this beauty chick -- and her Chief Technology Officer! -- when we say they work. I want this already!!! So cute! !